Wearing the robes of monks and using the Buddha’s profound words, the [NKT] has presumed to teach the world how to accomplish all of the things that [they have] in fact failed to achieve [themselves]. Through words alone, and a vast and very expensive publicity machine, the [NKT leader] has established for himself the position of a ‘God-King’ in the minds of [all] people [who follow NKT]. But behind the rhetoric, the public image and the charisma that has dazzled the world is a [troop of fools] who [have] failed repeatedly. Super Linktipp!!! Das Buch war schon lange fällig. Sicherlich wird er hier im gewohnten Umfang rezensiert. Dein Aktionismus macht Dorje Shugden und die NKT erst so richtig bekannt im Internet – wenn auch ganz bestimmt nicht wie in deinem Sinne. Thank you for writing this blog Tenzin. Your work is a great support and you are a true inspiration. At times I feel overwhelmed by the NKT’s outrageous media hype and collected lies and your work keeps me centred and integrated into a necessity to stop this greedy organisation. Ron Cook does not understand that having different perspectives on a subject matter is not a sign of inconsistency but a sign of understanding dependent arising and the relativity of truths [how can he understand this following people who cling fanatically to inherent truths, unable to see topics from different angles? ]; also he seems not to be able to understand that a humble person, like His Holiness or any other master, would never ever claim to have any realization [but how can he understand humbleness following people who are full of pride and disrespect for the wise?]. Also, that in certain situations violence is even permissible in Buddhism (the Buddha as a Bodhisattva killed the helmsman of a ship, when this helmsman planned to kill all people on that ship) is not taken in consideration either [but how can he be able to differentiate topics following people who cling on black-and-white-truths, lacking knowledge and ability to put things into perspective and to differentate things based on thorough understanding?]. What to do, a person with green sunglasses will see everything in green… while Ron Cook and most of the badly influenced NKT followers – as well as PRC leadership, Trimondi & Goldner – see only faults in His Holiness and Tibetan Buddhism, other persons see often these perceived faults as a sign of the underlying qualities, like humbleness, openness, non-clinging, honesty, being able to laugh about oneself and events…. PS: I think the organisation cannot be stopped but at least seekers of spiritual paths can be properly informed about the demerits of NKT. I read through the piece quickly-I find that such polemic language makes me feel uncomfortable.However, I noticed three things immediately. 1) The author criticises HH for claiming that ‘sleep is the best meditation’. Anyone with a knowledge of the completion stage knows that the most effective mediation is clear light meditation. Moreover, the sleep consciousness is significantly more subtle than the waking one and therefore transforming the clear light of sleep into the path is the most effective method of achieving the union of mother and son clear lights. The author therefore has no knowledge of Maha anuttara yoga tantra. 2) The author repeatedly condemns HH for claiming killing/violence is permissible in certain circumstances. The branch bodhisattva vows instruct us to commit any of the seven non-virtues of body or speech ‘where love and compassion deem it necessary’. The first non-virtue of body is to kill. Therefore the author does not even know the bodhisattva vows. 3) The issue of abortion being one acceptable under circumstances according to HH is raised. I too had difficulty with this. I investigated and found that it is entirely true that abortion is not permissible according to scripture. However, HH did not invent this teaching himself. He received this particular instruction from Trijang Rinpoche who re-assessed the Buddhist position in light of Hindu teaching which indeed does say that abortionis acceptable where the mothers life is in danger. In short, the author demonstrates clearly that he has little knowledge of tantra, Mahayana, or even the history of his own, NKT ‘lineage’ and its gurus teachings. Moreover, he/she also clearly sees no contradiction in writing what is very clearly a calculated political tract, condemning HH for being………calculated and political. Clearly, it is not only love which is blind; the term ‘blind hatred’ seems far more appropriate. I cant be bothered addressing the rest-it just makes me feel sick and angry at the arrogance of those who know so little or perhaps even do know but fabricate this nonsense because they know it has the potential for public appeal and therefore is useful in fulfilling the goal of the NKT and China of undermining HHs reputation. Pity this person; he is going to hell for an incalculable length of time. I would talk about the saying that the Dharma will be destroyed from within but that would grant the NKT a position they do not hold. The NKT/WSS are not preservers of the Dharma, they are its destroyers. Chinese puppets, knowingly or otherwise. I also remember condemnation of HH for asserting that we should rely on scientific reasoning and experience rather than blind acceptance of scripture. Quite apart from the fact that this sentiment is entirely in accord with the Buddha’s teaching, who advised that we test his teachings as if we were buying gold and never to simply accept things out of mere faith, the attack on HH is clear evidence of the authors position. Blind acceptance of ‘truth’ is rife in the NKT as the author proves. The attack on Hh for asserting that prayer is not enough demonstrates so much ignorance! Can we achieve enlightenment or realisation solely through prayer? No, we must act by practicing the Three Higher Trainings. The belief that prayer is the way is a theistic view. Later HH is condemned for speaking to a widely Christian audience and using the term God to convey meaning within the context of their understanding. Is the Dalai Lama a believer in God they ask? Er, what was your position on prayer again? Indeed to use sleep for meditation is highest practice for yogis. The late head of the Nyingma School, HH Mindolling Trichen Rinpoche, was famous for sleeping about 22 hours a day and using sleep for meditation. Another teacher of mine, the excellent Mingyur Rinpoche, had a teacher who used sleep also to see the three times. So if a student approached him for question he first fell asleep and later gave the answer. Westerners who didn’t understand it, left embarrassed the room and thought they addressed too “boring questions”…. But maybe we stop here our discussion of details, because Ron Cook may use the new information to correct his “ground-breaking research” by removing some of its plenty faults. Maybe it is better he makes a fool of himself, this could make him in the long run a bit more humble with respect to the wise, and to be more humble will help himself finally on his own spiritual journey. Thank you Xinhua State news agency. If the NKT seriously wish to practice Dharma as it was in the golden age of Tzong Ka Pa, they need to look back beyond Pabonka if they are to find a genuine representation of Tzong Ka Pa’s map of the path to liberation and enlightenment. The cult victims of NKT are not “Freeing Buddhism from Political Pollution” but “Feeding Buddhism with Political Pollution”. No Shugden follower has ever been killed, has been arrested or was punished for practising Shugden. I wonder how these guys can claim “Persecution, corruption, dictatorship, betrayal..” in the face that nothing of this happens in reality. It only plays into the hands of the Chinese government, who jailed today Liu Xiaobo for 11 years just because he says his opinion. Has any NKT follower, any Shugden follower or anybody from the WSS ever been jailed, tortured or murdered for practising Shugden? The answer is: No! This book is a big disappointment and a missed opportunity. It’s nature is that of a character assassination and not a work of real scholarship. It attempts to trash not only the Dalai Lama but everyone connected to him and everything that he has ever done. He is considered guilty not only of his own misdeeds, but, by association with the misdeeds of everyone he has ever met or associated! Is this really fair??? It seeks to attack the institution of the Nobel Peace Prize, and comments wryly that perhaps it is no surprise that it was awarded to the Dalai Lama since it has been awarded to so many ‘other terrorists.’ Never mind the moving and inspiring speech that Martin Luther King gave when he was awarded the Nobel Peace Prize, nor the consideration that the awarding of the Nobel Peace Prize to those who have chosen the path of peace and democracy over terrorism and violence could be considered as an encouragement and reward for that decision. No consideration is given to such subtleties – let’s just trash the Nobel Peace Prize – seeming because it was awarded to the Dalai Lama. On the plus side it reveals the totally unreasonable, unacceptable, and politically motivated attack on Dorje Shugden practitioners that the Dalai Lama has engaged in, and reveals the political nature of many of his activities. Where one can perhaps sympathise with the position of the authors is that the public perception of the Dalai Lama is so slanted in the direction of him being this goody-two shoes holy man, that perhaps it is believed that shock tactics are required in order to alert people to the reality of the situation? And since I have considerable sympathy for such characters as George Galloway and Michael Moore who shock tactics in trying to alert the world to the evils of American and British invasions and occupations of Arab states, perhaps my own position is a bit hypocritical? However, I also regret the polarising effect of such polemicists (particularly George Galloway – I don’t disagree with much of Michael Moore). People tend to fall into two camps either fall or against, with many people ignoring their message altogether because they find their tactics so distasteful. Is the same fate going to befall ‘A Great Deception’? I rather fear so. In honesty I do not really have the wisdom to judge on this one. It really depends on what purpose it is trying to serve. If its purpose is to send a serious warning shot to DL and those surrounding him, and encourages them to be on their best behaviour, then perhaps is succeeds in its own terms (I don’t really know). One thing I can tell you is that the tone of A Great Deception is not in any way a reflection on the typic character of members of the NKT. What I find so offensive about this book is its willingness to sacrifice anything and everything for the purpose of trashing DL. It is almost as though trashing DL is seen by the author as a sacred duty that overrides all considerations – but how can it be? 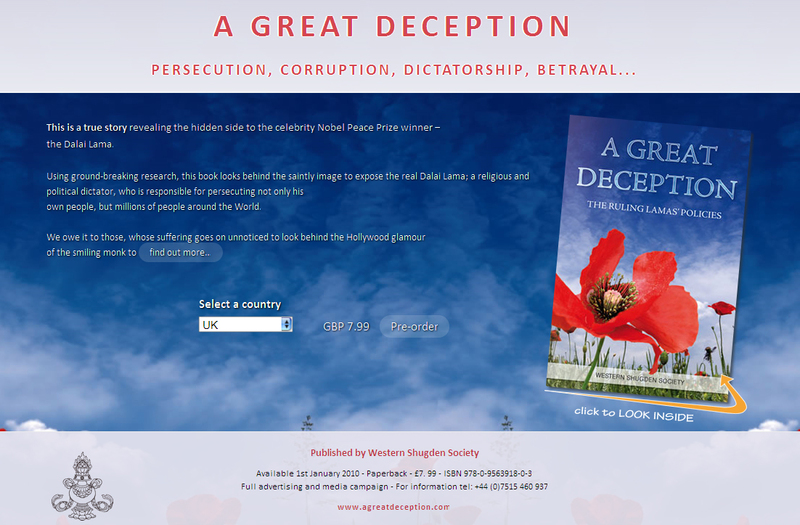 It is such a shame as there was and is an excellent book to be written – one based along the lines of Ursula Bernis’s research, helping the reader to develop appropriate compassion for Dorje Shugden practitioners who have been ostracised, and then explaining the likely motivation of DL. My hope was that we were going to demonstrate in order to get noticed and then explain our position in a balanced way. Now we have been told (by proxy) that there is no further need to demonstrate as Dorje Shugden practitioners have their freedom, but presented with a book riddled with defamatory nonsense that purports to be in defense of the freedom of Dorje Shugden practitioners. It doesn’t make a lot of sense and WSS makes no real effort to explain their position or rationale. Decisions about tactics have been made behind closed doors and the rest of us dumb sheep are expected to meekly agree with the what we are given. This is an alternative view from inside the NKT anyhow – it is possible to agree with the cause of ending ostracism within the Tibetan community and be somewhat alienated by the tactics used. Perhaps my hopes were just totally unrealistic anyway. To me the book looks almost cynical, because it abandons any attempt to present itself in a resonsonable, balanced, and reflective way. There is just no way that this book is going to get favorable reviews from anyone other than the most devoted WSS/NKT person. It is almost as though the authors gave up on the effort to write such a book before they had started. Perhaps they are right. Perhaps there is no way to write a book that would get serious attention and good reviews anyway, but wouldn’t it have been worth a go? Perhaps the author of that book would even have had the courage to stand up and be counted – i.e. sign then name to such a book. I can’t see us getting to that point now. The WSS seems to have chosen the path of villification. It is seriously difficult to understand this position or what purpose it is hoped that it will serve. Except perhaps as a hoped-for corrective to the spin of such people as Robert Thurman, but how??? She didn’t even want to cover this particular subject but just found that all of the Gelugpa Lamas that she interviewed were caught up in this issue. The pain and inner conflict experienced by some of those Lamas was just something else. Many of them said to her that they dearly wished that they had died before DL started speaking out against their protector practice. Could any kind-hearted person not have sympathy and compassion for them? Anyhow, I don’t have the time of patience to follow through on the intracacies of this argument – especially as I know that Tenzin is totally indefatigable in his defense of DL – LOL! Enough has been said to make it clear that it is possible to have sympathy for the cause of Dorje Shugden practitioners and their right to acceptance within the Tibetan community, whilst also feeling somewhat confused and upset by the current tactics of WSS as embodied in this book. There is so much kindness, gentleness, wisdom, and compassion to be found within the NKT. Of course there is plenty that is less than perfect too, but we are just people trying to follow the spiritual path, as are the community of Tibetan Dorje Shugden practitioners. It is regrettable that there has been this break-down in good relations, but DL is the person primarily responsible for this, as he is the person who instigated it. The defamatory comments made about Dorje Shugden practitioners being enemies of Tibet and Chinese collaborators were totally untrue and unbelievably hurtful. If you feel offended by this defammatory style of writing then why not try to have compassion for the the Dorje Shugden practitioners who themselves made victim to a campaign of vicious and totally untruthful villification? 1. I sincerely believe that there are kind people in NKT. 2. The vile manifest of NKT/WSS does not present the NKT people. But sadly it reflects the mind of NKT leadership, and NKT followers are strongly influenced by it. 4. we need definitely another approach here. but dialogue needs openness, and not defending positions. 5. I don’t know how to proceed. The complaints of Tibetan Shugden followers may be to some degree understandable and really be justified, on the other hand – as far as I can see – they never tried to discuss seriously and openly or to study the points which contradict their pov, not to speak about trying to understand how much this worship has been reported to harm others. There seems to be so much clinging that dialogue is impossible. To blame the Dalai Lama as the ‘sole creator’ and to try to improve their situation via NKT/WSS is completely counter productive, I think. I hope I could find more time for you and your thoughts, but I don’t have it or give other things more priority at the moment. Hence my terse comment. Again, I appreciate that you try to find another way. May your good intentions bear abundant fruits.